Now that I have been thoroughly blessed by Evelyn from the Internets and her Internet cousins (that’s you! ), I feel free to say that I am an expert in protective style slayage! Alright, alright... I’m going overboard with the self-aggrandizing, so let me turn down for a minute. The reality is that I. LOVE. PROTECTIVE. STYLES. From the moment the first braid was installed, I was hooked. Having learned from all of your comments and advice via YouTube and Facebook, I decided to share some insights that have helped me maintain my Bantu knot and box braids this summer. Take note of some of the products I love and the tips I found most helpful. 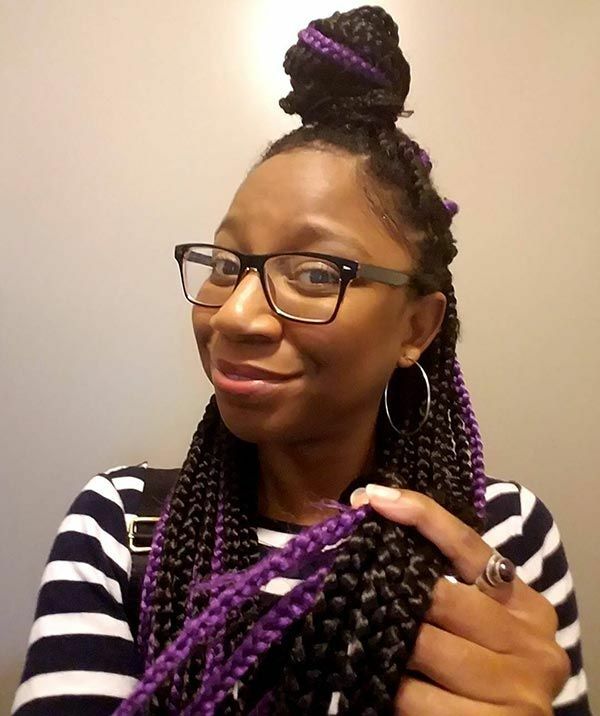 Shoutout to all of you for helping get the best out of my very 1st braids installation! Y’all are the G.O.A.T. If you’ve yet to witness me completely fall head over heels in love with box braids, scroll down to the end of this article to see for yourself. Still working on my bun skills, fam. Prior to getting your #summertimefine braids, weaves, and faux locs installed, give your natural hair a deep treatment. I recommend SheaMoisture’s High Porosity Moisture-Seal Masque. I leave it in for 15 minutes, then wash it out. Massage a bit more oil onto scalp after rinsing. Avoid product build up! How? Cleanse your scalp with a gentle shampoo. As mentioned in my last article, my go-to is Naturally Smitten Black Soap Shampoo. I put it in a spray bottle, dilute it with water, and spritz it onto my scalp. I learned this nifty trick from @journeytowaistlength (if you are reading this, you are my hero). When your scalp needs moisture, which can seem like every second of any summer day, Mielle Organics is a reliable spray leave-in conditioner. Taking a note from YouTube commenter Chelsea Staples, I let this leave-in cool down by placing it in my freezer for 3-4 minutes. Then I spray my scalp to cool it down. Yes, I know that we’re talking about hair, but how are you going to stay cute if you’re ashy? Stay hydrated by drinking water. Seriously. In addition to drinking H2O, grab a favorite body lotion and slather it on! My love is focused on the thick consistency and musky aroma of SheaMoisture African Black Soap Body Lotion. Always keep a pair of sunglasses or clip-ons nearby, if not on your face! UV rays are not just bad for your skin and hair, but your eyesight can suffer. You don’t want to be blindsided. I am not the end-all, be-all of protective hair; that’s why I am so curious about how you maintain your style! What are your summer survival tips for those of us wearing protective styles? Share in the comments! For more tips for protective style maintenance and to see my box braid journey to Afropunk, follow me on Instagram @gerilynhayes! Don’t have an IG account? Follow me on Twitter @gerilynhayes! Like what you see? Groovy! Follow NaturallyCurly via YouTube for more of the content you love. As ever, stay braided up!